One of the perks of blogging is meeting interesting and successful people. Yesterday, I was privilege to meet the man behind Bo's Coffee, Mr. Steve D. Benitez - Bos' Coffee Founder and CEO. Other business owners would simply task their Marketing Managers to meet Bloggers and explain their new products, but not Mr. Benitez. He even arrived earlier than the specified time of the event. Sir Steve walked us through his love for coffee as well as how he started Bo's Coffee business. Bo’s Coffee is a proudly homegrown specialty coffee brand, and since 1996, it has grown to include around 56 outlets strategically located in Metro Manila, Cebu, Davao, Cagayan de Oro, Bacolod, Iloilo, Bohol and Tacloban. Sir Steve introduced us all to The Philippine Origins product line, namely Benguet, Sagada, Matutum, and Kitanglad. The Philippine Origins is a homegrown brand Bo’s Coffee is inviting everyone to try out . These coffee beans are named after the places where they are sourced - Benguet, Sagada, Mt. Matutum, and Mt. Kitanglad. These four are roasted to perfection by artisan roasters, these coffee beans also reflect the vision of a brand that dreams of putting Philippine coffee back on the map. “The Philippine Origins product line is a celebration of the country’s culture and its great coffee. All of our beans underwent a rigorous cupping process in order to make sure that our customers will get only the best from us” Sir Steve said. What’s fascinating about these Single Origin Arabica beans is that it enables coffee lovers to get to know the featured places in a different way through its flavor profile. 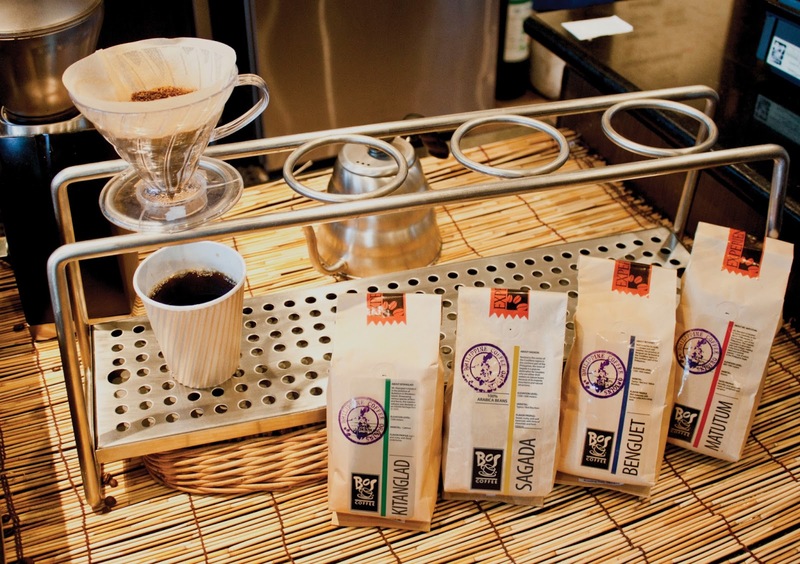 Sagada, for example, has a sweet, nutty, and well balanced taste, with hints of chocolate and fresh tobacco. Benguet, which is near Sagada, is also well balanced, with herbal notes. Mt. Matutum, which is located in Mindanao, features a berry-like and spicy taste, and Mt. Kitanglad, which is also in Mindanao, is perfect for coffee drinkers who are looking for something light and nutty, with a hint of floral undertones. These Single Origin coffee beans are available at the following Bo’s Coffee branches: Bonifacio High Street, Glorietta 5, SM Mall of Asia, Newport, Galleria, SM North EDSA, NAIA1, Jupiter Makati, Solenad, and Megamall. I'm fairly familiar with this line because I buy Benguet at Bo's for my husband. What surprised me about this intimate invite is the Pour Over Method demo. My husband likes brewed coffee but when electricity is out it's a problem. With Pour Over Method demo I learned an alternative way of preparing brewed coffee - the manual way. The Pour Over Method requires a steady hand, a brew bar, a V60 cone, a swan kettle, a weighing scale, and precise water and temperature measurements in order to produce a flavorful cup of coffee, and it is certainly a delight to watch. Thanks, Allen. Twas nice meeting you too. Learned a lot. See you again soon.